It appears that Asus is testing a dual-slider phone, according to renders contained in tweets disseminated today by tipster Evan Blass. One of the unnamed handsets supports 5G and features a large edge-to-edge screen in front. On back, there is a dual-camera setup. The top slider houses a pair of selfie snappers including a 120-degree wide-angle lens. 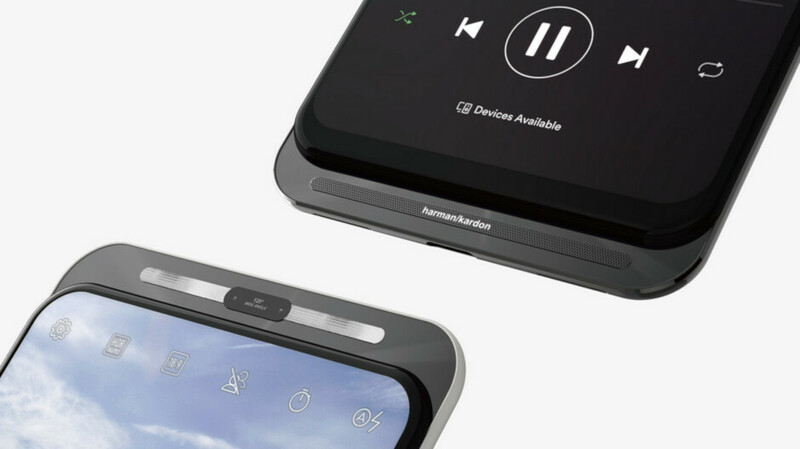 The bottom slider carries a Harman Kardon speaker, and the handset could feature an in-display fingerprint scanner. According to Blass, the person who designed this render was a member of the team that created the Asus ZenFone 5. Other renders tweeted by Blass today show a different Asus phone with a similar dual-slider form factor. While the top slider on this other model also hosts a pair of selfie cameras, the bottom slider would be used to show contextual virtual controls and buttons. With the top slider open exposing the front-facing cameras, we would see virtual controls appear similar to what is shown in the render, including a shutter button. Other times, different buttons and sliders would be available depending on what the phone was being used for. This model features a rear-facing fingerprint scanner. We have seen a number of different ideas peddled lately by phone manufacturers looking to improve the screen-to-body-ratio of their handsets without having to resort to a notch. ZTE recently showed off a couple of concept phones with edge-to-edge displays. One render depicts the Axon V with a dedicated panel jutting out from the side, containing a pair of selfie snappers and other front-facing sensors. The Axon S render shows a phone with a side-sliding panel that has cameras on both sides that would be used for both regular photos and selfies. As a result, the back panel is completely clean, an usual but interesting look. Later this month, the Oppo Reno is expected to be introduced. This device uses a motorized wedge that comes out of the top of the phone. The wedge contains the phone's selfie camera and a flash. Based in Taiwan, Asus does sell some of its handsets in the U.S. Therefore, it is possible that if it does produce a 5G dual slider, the phone could be available with support for some U.S. carriers. I hate lack of symmetry. If you cant remove the bottom bezel because of screen connectors, no point of doing that on top. It is ridiculous to me. True. it does't matter to have very small bezel on top and put small front camera (just for social media selfie and vidcal) like Meizu 16s render. Unsimetrical bezel looks less artistic. Work on that chin before going to such lengths to hide the notch... it's stupid, really. All screen? What’s so hard about putting a small selfie screen in the back of the phone and everything else such as the speakers, etc located in the back of the phone? Phone makers come up with all types of stupid ideas such as the notch as a solution when it could all be fixed by putting everything in the back of the phone. Good idea, however, how would you video chat on a small selfie screen? I think people would prefer an under-display selfie camera or a rotating camera where the rear cameras act as a selfie camera as well. The pop-up camera is still the best solution.